New for 2007, Marshall is proud to present the AS50D. Built upon the award-winning AS50R, this superb amplifier features a new tweeter, a phantom-powered microphone channel, digital chorus and reverb. The new AS50D allows you to express your emotions with passion. Marshall CLASS-5 Class5 delivers all-valve pure tone in a simple format which puts your customers directly in contact with the amplifier's raw abilities and tone. The 5W output allows you to really drive the amplifier to a level where both the pre-amp and power amplifier stages deliver to their full potential for an unmistakable all-valve playing experience, without traditional high volume levels. The Class5 answers the needs of both novice players and artists alike. At last, the valve sound, sensation and all-valve power of a Marshall stack, but in a more compact lower wattage amplifier. Combining elements of classic looks, the Class5 will appeal to users who like a more traditional styling. 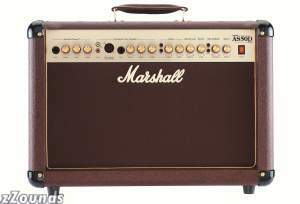 The Class5 top loading' format is indicative of more traditional Marshall combo amplifiers. This format makes navigating the controls on the fly very easy without having to crouch down to find the right dials. Finished in traditional Black Levant covering and the same fret cloth as used on other traditional Marshall amplifiers and furnished with the highest cabinet components, the Class5 stands out in the crowd with its true Marshall pedigree. The cabinet's looks and quality don't end at what you can see. Underneath the vinyl covering is a quality, hand-built, birch ply cabinet using traditional finger joints for additional strength and superior tone. Every Class5 is subject to Marshall's rigorous testing procedure and quality control, meaning that not only can it achieve fantastic tone but it also lives up to the requirements of roadworthiness that is dictated by every guitarist. The incredible thing about the Class5 is its volume, it is 5 Watts of REAL valve power, much louder than many would expect. Also, it is impossible to mistake its true class A tone, richer in second harmonic distortion making it pleasant sounding to the ear. The simple layout of the controls for the Class5 makes easy work of reaching great tone.